On my final day of school, before dismissing for the holidays, I am flooded with feelings of good will. In my art history classes today, we are focusing on Paul Cezanne and his struggles to find his own place in the Impressionist world, while at the same time opening the door to the twentieth century and modernism in painting. I love this statement from Truman Capote because it fits the philosophy of Paul Cezanne and my best art teachers like a glove. I wonder daily over where my life is going, in art as well as in the broad contours of things we must do. And today I find myself thinking over how I can rearrange some of these rules to present my ideas better. 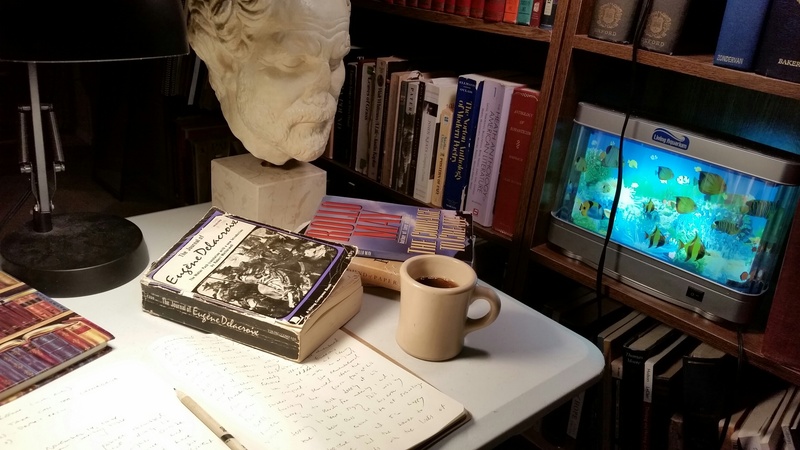 What bewilders me as I prepare to sail into these holidays is a series of messages received from several sources over this past week reminding me that others are looking at my daily work and blog. This only makes me want to work more fervently in what I write and the images I post. Last night, just before bedtime, I received notice that my blog was included in the website http://www.artmatch4u.com/wblogs2.html. This alone makes me swell with a sense of pride, but much more, I want to be better at what I accomplish and publish. Though my blog will probably silence over the holidays, it won’t be due to a hiatus–I’ll simply be working harder and trying to write better things in the weeks ahead. 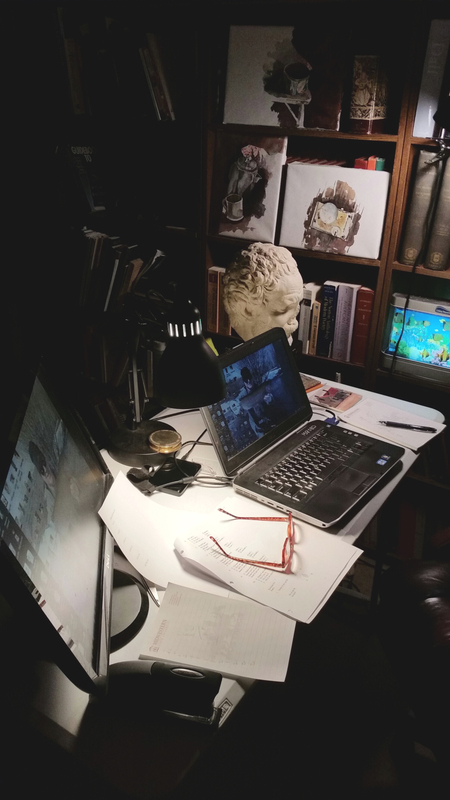 If the blog is silent, the drafting table and journal will be busier than ever. I’m so grateful to have some quality days away from the daily job. Thanks always for taking time out to read what I post. My weekend was fuller than usual, spent largely in east Texas at a Christmas event, and then with friends I’ve appreciated for many years. 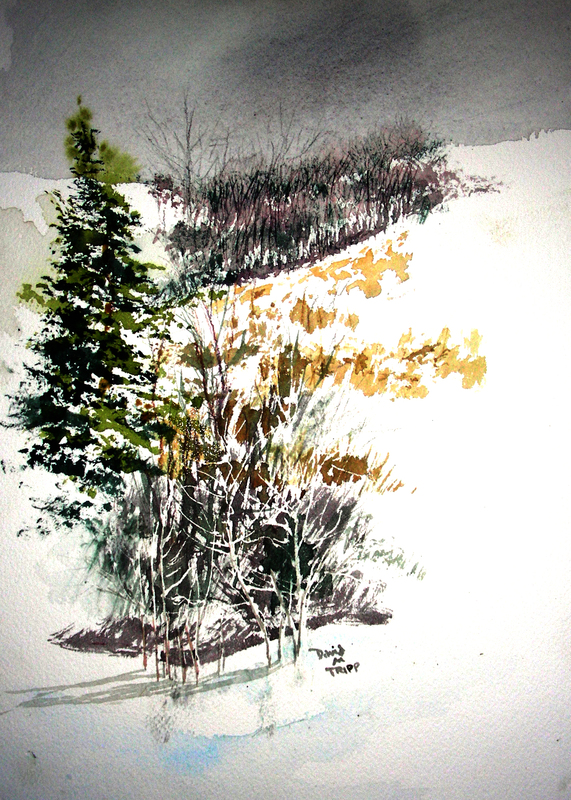 During my escape from the city, I managed to toss out a couple of watercolor sketches, and felt very alive doing so. This morning, I awoke to a world in Athens, Texas that was just exploding in autumn colors after more than 24 hours of rainfall. I took a number of photos, but wasn’t satisfied until I worked on the small watercolor posted at the top of this entry. Following breakfast, we went out on the back deck, looked across the property at these gorgeous colors, and drew out watercolor supplies to see if we could capture some of this essence. 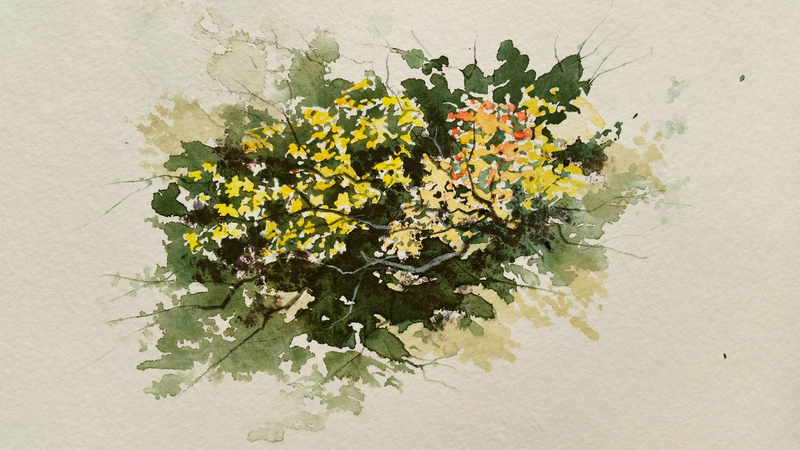 My attempt was quick and small (about 5 x 7″) but my heart swelled with delight as I gazed at the natural beauty and reached for colors in an attempt to respond to what I saw and felt. 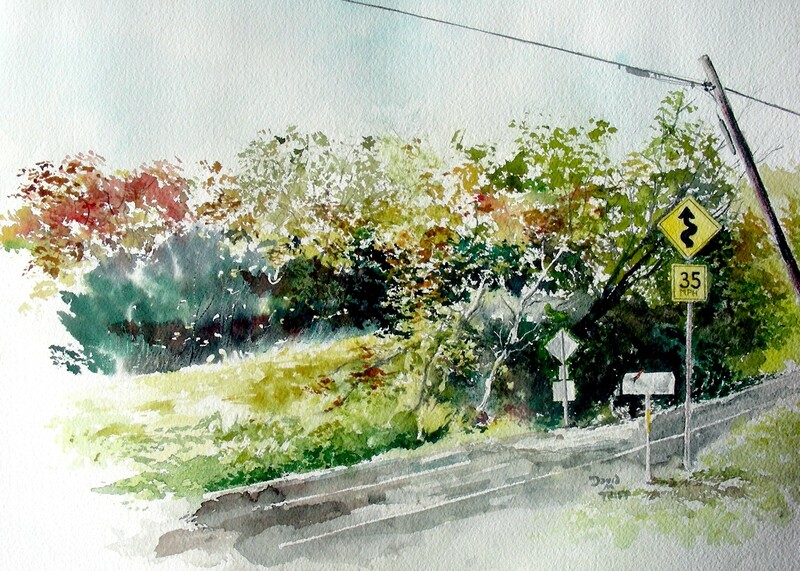 Despite many promises that I made to myself, this was in fact my first attempt this fall to attempt a plein air watercolor sketch of the changing of the seasons. I saw it coming for weeks, but just never turned from my daily schedule to pursue this project. Today felt good as I finally settled into it. A part of me wishes for more time to pursue these interests, but seriously, most people lack this quality time, yet know how to appreciate it when the scant moments offer themselves up for creative exploits. I’m happy to have received this gift this morning. I think I’ll put this small watercolor into a 5 x 7″ window mat and place it inside an 8 x 10″ frame. I believe that $50 will be a fair asking price for the piece. This Saturday has been a day filled with wonder. I was invited to attend “Christmas in the Village” at Breckenridge Village in Tyler, Texas. 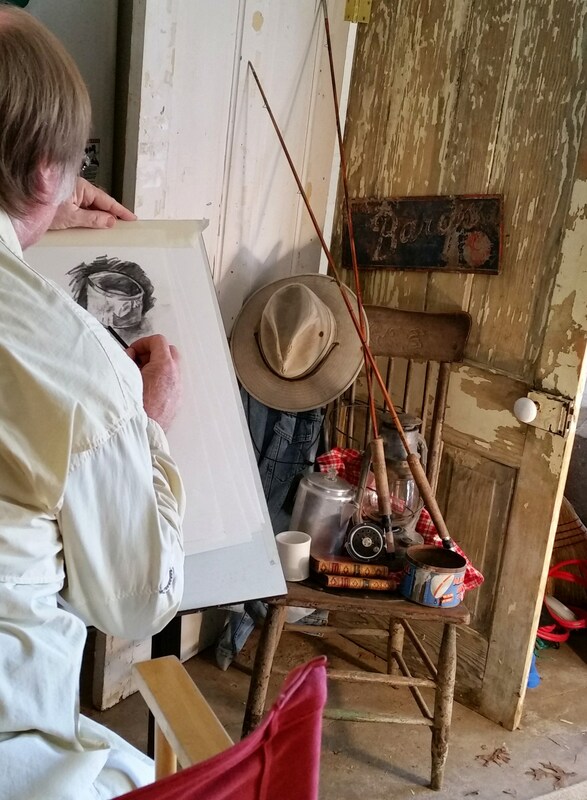 My artist-friend Bubba Norris, a resident of the Village, displays his art there, and this year I got to sit with him in his booth and watch him make original art. Sometimes I get more of a thrill watching someone else labor over his/her creation than I do my own. This day was no exception. The unexpected bonus was learning that Bubba played in a handbell choir and I got to attend their afternoon recital. 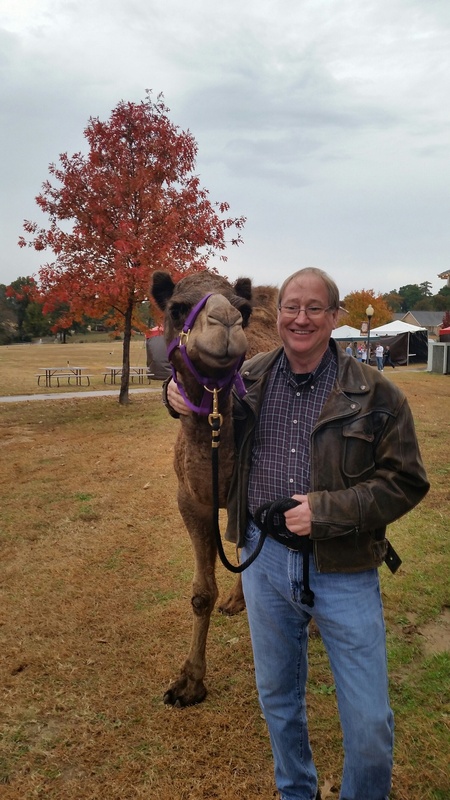 This was my second year to attend “Christmas in the Village” and I was saddened to learn that Clyde, the camel that I posed with for pictures, died since last year. He was 28. He was replaced by Godiva, and I found her to be just as cuddly. Following the event-filled day at Breckenridge, I found myself exhausted by evening but was delighted to sit quietly with friends. 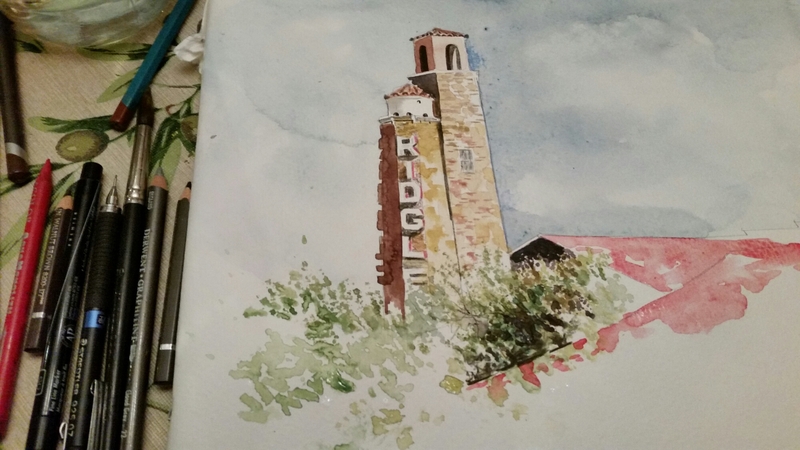 Three of us experimented with watercolor sketching, and I found the company very affirming. I did this quick sketch of the Ridglea Theater on Camp Bowie Blvd. in Fort Worth, about 8 x 10″ overall. I would seel this one, matted, for $100. I’m quite proud of how it finished out. 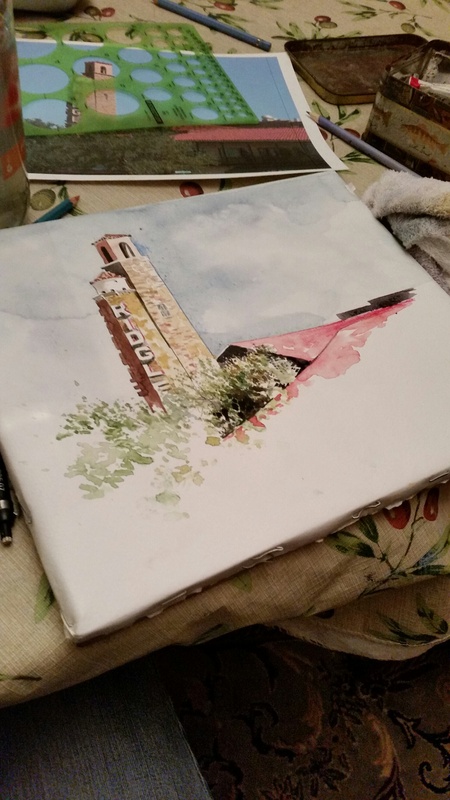 I have painted the structure several times, but decided it was time to work on a small, quick one. Once I laid down the brush, I decided it was time to retire for the night–I don’t bounce back from full days the way I used to do. Thanks always for caring enough to read me. It is turning out to be an excellent night for putting some thoughts down in my journal, despite the reality that my furnace broke down 24 hours ago, and will not be repaired before tomorrow. Temperatures dipped to 30 last night, and threaten to do so again tonight. The house is cold, but things are not so bad–in fact they are quite good. A small electric space heater is adequate to warm the space that I occupy, and so I am finding ways to live in a smaller space until the cavalry arrives tomorrow. As I shambled through my crowded chamber earlier this evening, I sensed that I was smiling, and wondered what exactly that was all about. In my younger years, these physical circumstances would have left me fuming. So why is tonight so good, after all? Simply put, the recollections of all the experiences that wove together throughout this day to produce a beautiful existence. All I have to do is recall them, one by one, and then smile at them collectively. It was a profound honor this morning to be invited to sit beside a struggling, yet determined A.V.I.D. student wrestling with an assignment for A. P. English over an Emerson essay. As she read aloud pointed texts from this sage and faced specific questions, I happily asked her questions the way these A.V.I.D. students do when collectively learning in their tutorial circles. I didn’t have to give her any answers. One by one, she solved each problem, then moved on to the next, and I just felt joy brimming inside me, watching her countenance brighten and her eyes focus every time she “got it.” All I could hope is that she would come to love this man’s words as much as I have in my later years. After that session, my Philosophy class came in for their scheduled exam (which may not have been a natural high), followed by a roundtable discussion on Emerson’s “Self-Reliance” essay. I shall always remember and cherish what transpired in today’s discussion, watching the sincerity of students willing to explore difficult questions that took them to the edge of their own traditions. I shall never forget the words of one of the girls expressing that Emerson’s “American Scholar” speech “resonated” with her. She left me her journal to read which included a poem she composed about a particular experience of driving through the night that brought her to enlightenment. The vocabulary was charged with Emersonian sentiment, and I felt tears as I read it, and recalled the expressions on her thoughtful countenance every time she responded to the discussions of today. The bell rang. It was time to go to lunch. But one young man remained behind to talk, to give up the early part of his lunch period. He talked of the values which so deeply stir him at this stage in his life, and then, as he was preparing to leave, told me that this class was undoubtedly the best he has ever had in his educational odyssey. 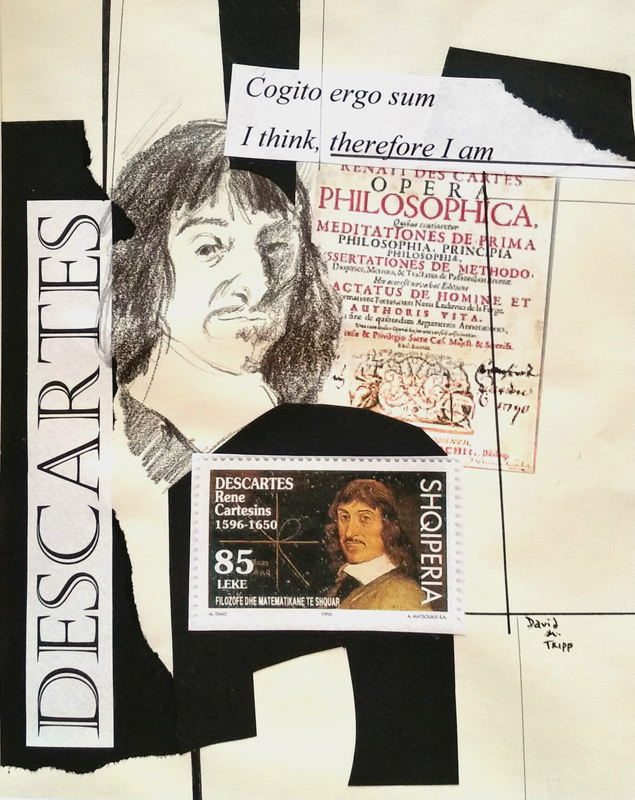 I believe him, and it stirs me deeply, because I have had this unspeakable honor to join his hands with those outstretched hands of Plato, Augustine, Descartes, Kant and Emerson among others. And we still have a few weeks left to learn from others before this young man continues the rest of his journey without me. 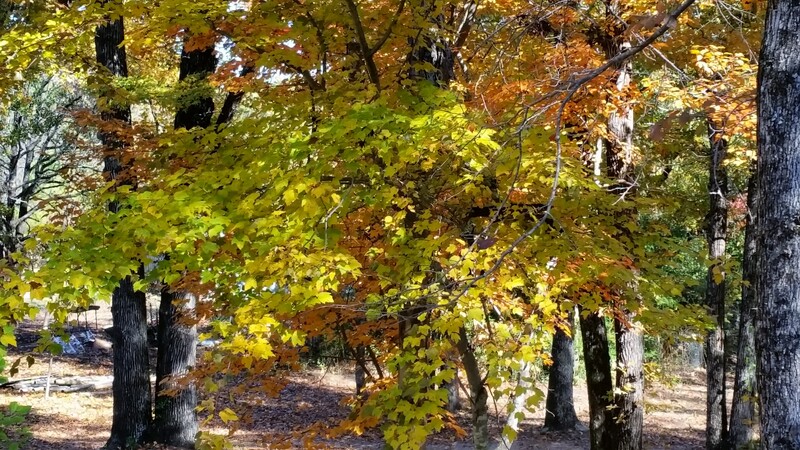 I am pleased to know that he has been transformed, and grateful that he, the afore-mentioned young ladies, and all the rest of the students passing through, have given color and texture to my life. Who needs a furnace tonight?! Yes, tonight I have sundry reasons to smile. Life is complex with these myriads of details and decisions that zigzag our way through each day. But I am convinced that we are going somewhere. And the journey has quality. Thanks for reading, and sharing this night with me. I’ll take weeks out doing drawings, watercolor studies, I may never use. I’ll throw them in a backroom, never look at them again or drop them on the floor and walk over them. But I feel that the communion that has seeped into the subconscious will eventually come out in the final picture. I’ve been reaping a whirlwind the past few days. My two schools are hurtling toward the close of the fall term with all its craziness. Holidays are drawing nearer, temperatures have plummeted, and my afternoon/evening engagements seem to be increasing of late. In the midst of all this, I still find the quiet center for art. I sketch daily, either in charcoal or watercolor. The one posted above was begun last evening at the Trinity Aritsts Guild gallery in Bedford, Texas. Several of us gathered to paint, chat and enjoy one another’s company. Following the ninety-minute sketching time, I was privleged to have a late dinner with more meaningful conversation. All of the ideas exchanged last night, combined with the time making art, awoke me in the morning darkness, long before the alarm was to go off. My mind was surging with ideas, all of them good. I have good friends to thank for those mental resources. School today is on a Pep Rally schedule and the football playoffs are underway. Everyone’s mind seems to be on everything except education. So . . . I have pushed my art history students into another day to study Andrew Wyeth’s work, and I pause for a moment between classes to photograph last night’s sketch that I’ve had on my desk before me all morning. This is turning out to be an excellent day for rumination, reflection and recording. My journal is filling up, and I am in the mood to start another sketch. 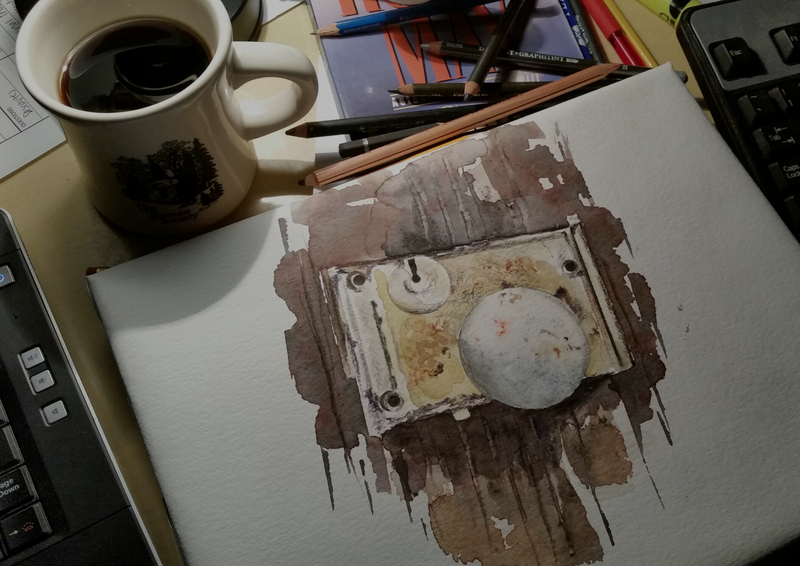 With each successive sketch, I feel myself getting closer and closer to beginning the large still life composition that still waits patiently in the dim recesses of my garage studio.